In the years since Fidel Castro came to power, the migration of close to one million Cubans to the United States continues to remain one of the most fascinating, unusual, and controversial movements in American history. María Cristina García—a Cuban refugee raised in Miami—has experienced firsthand many of the developments she describes, and has written the most comprehensive and revealing account of the postrevolutionary Cuban migration to date. García deftly navigates the dichotomies and similarities between cultures and among generations. 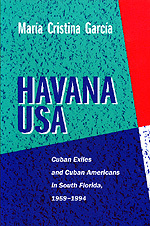 Her exploration of the complicated realm of Cuban American identity sets a new standard in social and cultural history. María Cristina García is Assistant Professor of History at Texas A&M University.